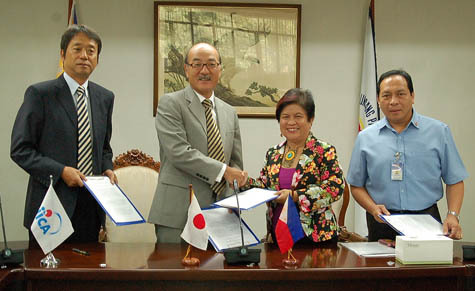 Japanese Ambassador Toshinao Urabe attended a turn-over ceremony of Japan's emergency relief goods for the victims of a strong earthquake that hit the central part of the Philippines on October 15 to the Department of Social Welfare and Development (DSWD). The ceremony was held at DSWD in Quezon City this morning, October 31, 2013. The assistance, worth 38 million yen (approximately 16.7 million pesos), aims to alleviate the difficulties of the people affected by the calamity. It includes 150 tents and 485 plastic sheets expected to mitigate the difficult living conditions in and around evacuation centers. The emergency assistance was announced Wednesday in light of friendly relations between the two nations and in line with the Japanese Government's commitment to assist the Philippines' disaster management efforts.